Field Intensity 10KG. +- 5% in an air gap of 10mm., Air- Gap is continuously variable upto 100mm. with two way. Pole Pieces 50mm. diameter, Normally flat faced pole pieces are supplied with the magnet. Energising Coils Two , Each coil is wound on NON-magnetic formers and has a resistance of 10ohms. approx. Yoke Material U shaped soft IRON. 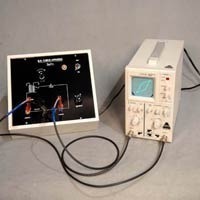 A high current Continues power supply is workable on 220v50Hz with output is 90 volts 6Amp(approx.) depend on the load (electromagnets).The power supply consist One Current Meter, A.C./ON switch to ON the power, Level knob tocontrol current in Electromagnets. The magnetic strength can be variable by this knob, Output terminals are to take output from power supply to connect it to Electromagnets. Nuclear Magnetic Resonance (NMR) was discovered by Bloch and Purcell in the year 1945. 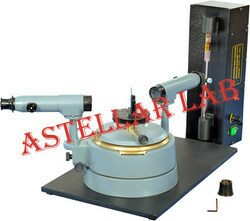 Over the years it has developed into a very useful and powerful tool in solid state physics, chemistry and biology. In medical application this technique, under the name Magnetic Resonance Imaging (MRI) has been developed as an excellent imaging method for clinical diagnosis. In this method use is made of Zeeman interaction of the magnetic dipoles associated with the nucleus when placed in a external magnetic field. Exp-1 To determine the wavelengths of Balmer series in the visible region from hydrogen emission. Exp-2 To determine the Rydberg constant. R is Rydberg constant ( R = 4/B where B is the Balmer’s constant). In the present setup, the spectral lines of hydrogen is observed by means of diffraction grating. The wavelength of the visible lines of Balmer series of hydrogen are measured by spectrometry. The apparatus is designed to work on Mains, with Built-in H.T. Power Supply. 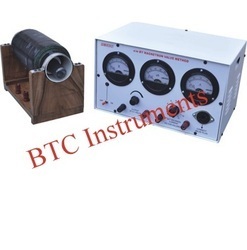 It is provided with other accessories such as solenoid Rheostat. Fixed Output DC Regulated Power Supply of 15V. Builtin Sine Wave Oscillator of 1 kHz frequency. Capacitor & resistance are mounted behind the front panel selectable through SPDT switches with connections brought out on sockets. One potentiometer (S) is mounted on the front panel to change the phase difference. One operational amplifier IC 741 is placed inside the cabinet with connections brought out on sockets for 180°Phase Shift. Looking for Practical Physics Engg Btech ?